With toilet paper question solved you ask your host where the restroom is. After the Great October Socialist Revolution in 1917 the housing problem was solved by adding more tenants to the existing apartments sometimes leaving original owners with a small room in their previously spacious quarters. This went well together with some idiot’s dream of communal living but created lifetime of conflicts and misery which is still going on. The resulting apartment was called “kommunalka” which is simply a communal apartment. All my life from birth till age 22 I lived in such an apartment. First, our family of 3 shared an apartment with my grandparents (2 people) and my aunt’s family (3 people) and the apartment had a total of three rooms, one small kitchen, one shower and one toilet. Then we moved to a place where in a larger apartment five families shared the same common facilities sans the shower and hot water. Imagine for a minute your Christmas guests permanently moved into your house, then multiply the misery times 5 and you may get close to what the kommunalka was. Communal leaving did not translate into shared fiscal responsibilities. That’s why when you approached the restroom you would see a number of light switches of all shapes and sizes, everyone had their own electric meter. Using your neighbors electricity was a huge faux pas, I don’t recall any fights in our apartment but we were “lucky” to have non-violent and mostly sober neighbors. Guests using lights other than their host’s would probably get a nasty look. Hygiene problems were solved by each family owning a toilet seat. If you read carefully so far, you can easily calculate that our restroom wall sported 5 toilet seats and looked something like this. 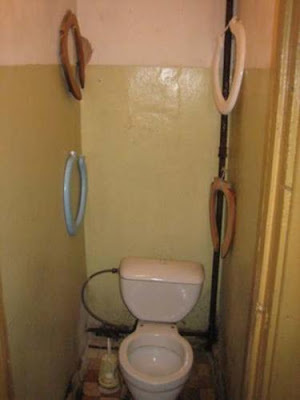 Needless to say that I did not anticipate the thirst of my readers for toilet stories, so the picture below is not mine. In lieu of the toilet seat game some people resorted to climbing up on the stool somewhat resembling an eagle but, anyone who had seen me knows that I am not a contortionist and not a huge risk taker to perform something like that. Note: I don’t know who the model on this photo is, I am posting it strictly in the interest of truthiness. Finally, clutching your precious square of toilet paper, with the correct light switch on and your favorite toilet seat in place you are ready for the act. Of course, I don’t even have to mention the need to mouth-breathe at all times, most places did not have any ventilation and deodorizing sprays were not available. My apartment had a window in the restroom so the smell problem was somewhat fixable. At times you would hear suggestive knocks on the door reminding you that you are not alone and other people have to use the bathroom, you are not in the frigging library, etc. Sometimes knocking on the door would become more intense indicating that your time has expired, or else. You get up, you use you allocated TP, you pull the handle and….nothing. We lived on the third floor and half the time we didn’t have running water. Years later the pipes were replaced and they found that the old pipes where completely clogged up. Until then we had to carry the water upstairs in a bucket like mythical Sisyphus just so we can flush it down the toilet. So if your host left around a bucket of water you breathe the sigh of relief, flush the toilet and exit into the crowd of people giving you evil eyes and nervously dancing by the restroom door. Still, you are lucky you were able to use indoor plumbing. In most of the rural areas and old buildings in the city the facilities were outside but that’s a different story.